By replacing your windows you've actually made your home "tighter", reducing air flow between the inside and outside which has resulted in trapped humidity. Your new windows are making your home much more energy efficient, lowering your energy bills and adding comfort to your home by blocking air movement. By building an energy efficient home, we may create other problems that need addressed. Shut off any household humidifers (this includes the furnace humidifier). Ventilate your home regularly. Air out your home a few minutes each day and high moisture areas, like bathrooms, duing use. Run exhaust fans longer and more often. Make sure any louvers in your attic and basement are large enough and open. Add a dehumidifier to your basement. Properly vent any humidity producing appliances such as clothes dryers and gas burners to the outdoors. To maintain a certain level of comfort and health in your home, it must maintain a certain level of humidity. The easiest way to test this is with the use of a psychrometer. The following chart shows the maximum safe humidity levels to a home heated to 70 degrees Fahrenheit. Lower levels are required for higher indoor temperatures. 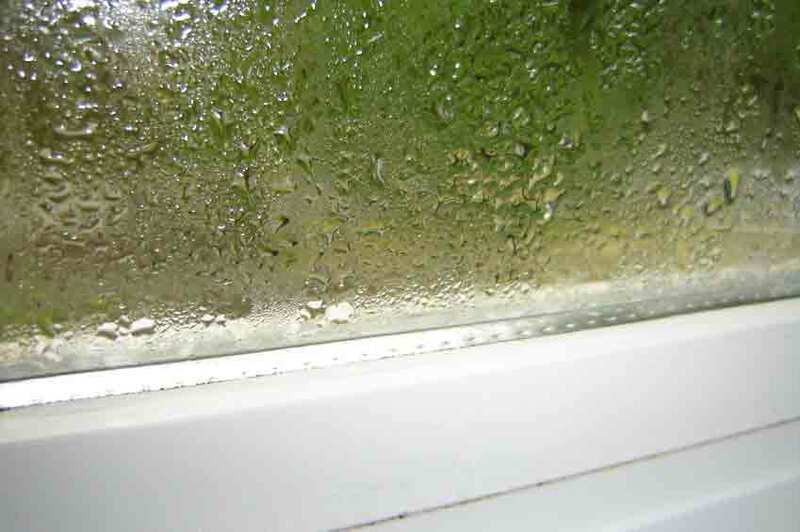 While these tips will help solve a majority of the cases of window condensation, sometimes persistent humidity problems may be more difficult to solve. In these cases, you may have to call a qualified expert for advice or direction specific to your situation. Should you have any questions regarding your new windows, please feel free to contact us and we will do our best to assist you!